I never thought I would become attached to a kitchen tool. That is, until I met the Oxo angled measuring cup. 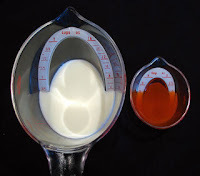 The 2 oz measuring cup, shown on the right, allows one to accurately measure amounts as small as one quarter ounce. In addition to ounces, their are interior markings for tablespoons and the more traditional exterior markings for milliliters and cups. Mr. Jigger you have served me well, but from now on this detail oriented cocktail lover will be angling for Oxo. Let’s put that quarter ounce line to use. Combine ingredients in a mixing glass with ice. Stir. Strain into a cocktail glass and garnish with a flamed orange peel.